Effective tomato fertilizer, whether organic or not, provides nutrients tomatoes need at different stages of growth. To grow successfully, tomatoes need nitrogen, phosphorus, potassium, potash, calcium, and magnesium, along with other trace minerals. It’s always best to have your soil tested to check for nutrient levels and pH. You can test your soil yourself, both its nutrient levels and its pH, in a simple, inexpensive soil test kit. Or contact your local extension office and ask about local soil testing services. Tou can also find simple (but accurate) pH test kits online. Test results may show a particular nutrient deficiency. Then you can amend your soil appropriately. Soil nitrogen content should be higher than phosphorus content. The next step is to select a tomato fertilizer. Most fertilizers are a combination of the three nutrients commonly fed to plants: nitrogen, phosphorus, and potassium (referred to as the “N-P-K ratio”). A commercial fertilizer’s analysis is listed on the label in a three-number series, such as 15-10-5. The three numbers represent those three nutrients. A 15-10-5 fertilizer contains 15% nitrogen, 10% phosphorus, and 5% potassium. The remainder of the fertilizer is filler material. Nitrogen. Nitrogen encourages leaf growth, which is why fertilizers with higher ratio of nitrogen (the first of the three numbers) are an optimum choice for lawns and grasses. But in tomatoes, excess leaf growth discourages blossoms and fruit. A complete fertilizer with a balanced supply of the three major nutrients, such as 10-10-10 or 5-10-10, is a better choice for tomato plants at initial planting time. Stay away from high-nitrogen fertilizers such as urea, ammonium sulfate or fresh manure, which will help produce dark green, tall tomato plants but fewer tomatoes. Phosphorus. Phosphorus (the second number in the N-P-K ratio) encourages flowering, and therefore fruiting. Potassium. Once a tomato plant starts flowering, it needs a higher ratio of potassium (the third number in the N-P-K ratio). Good organic sources of potassium are granite dust and wood ash. 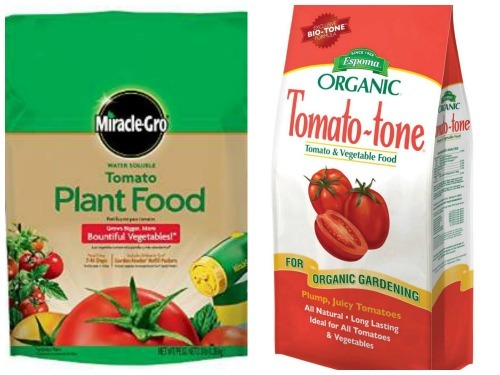 Tomato Tone: (4-7-10 or 3-4-6): a granular fertilizer that is worked into the soil. Tomato Tone is organic and contains calcium, magnesium, sulfur and trace nutrients. Once a plant is established in the garden, a phosphate-concentrated application (such as 0-46-0 commercial fertilizer) every 6-8 weeks increases tomato production. Bone meal, with an analysis of 4-12-0, is a good organic source of phosphorus. When a tomato plant sets fruit, start a systematic fertilization program and feed every three weeks until frost. See more on our Fertilizing Tomatoes Pinterest board. Does tomato fertilizer potency stay strong over time? Tomato fertilizer question: will this fertilizer work for tomatoes?